Our latest blog is by Emma Muscat, a social historian and blogger who we got to know back in March she tweeted a picture of our Bible saying ‘the Bible baked in a loaf of bread is one of my favourite artefacts I have ever come across’. Last October, I was filming with the BBC at Rochester Cathedral. Finishing early, I unexpectedly found myself with a couple of hours to spare. I decided to visit the town’s Huguenot Museum, tucked away on the main High Street. Opened in 2015, the building is located on the top two floors of a former French Hospital. In my opinion, it is one of Rochester’s top hidden heritage gems. The Bible which had been baked in a loaf of bread (ref: FH2013.360), was one of the first exhibits that caught my eye. I did a double-take, I couldn’t quite believe what I was reading on the description label! I am always looking for unusual museum artefacts that have fascinating backstories. In that very first instant, I knew there was something rather special about this object, I was right. 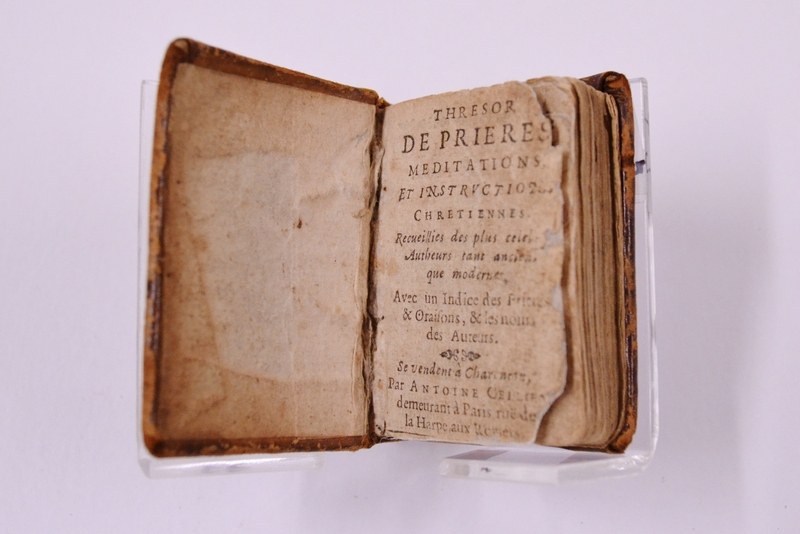 The Bible dates from 1590 and belonged to the Fasquet family, Huguenots, who lived in Drôme, southeastern France. The Bible’s height is 240 mm and open dimensions are: width 410mm by depth 85mm. There is scorching and water damage visible on the paper edges. The title page has been removed to conceal the printer’s identity. There are also pages recording Fasquet family births, marriages and deaths until 1625. Why was the Bible baked in a loaf of bread? According to Fasquet family tradition, during a search of their home, the Bible was hastily baked in a loaf of bread to hide it from state soldiers. I discovered, during the course of my subsequent research, that the act of hiding your family Bible, particularly before or during a state raid, was commonplace. The home could be searched at any time, if authorities found family members in possession of a Bible, they could be arrested, imprisoned and possibly executed. The Bible would have been immediately destroyed. 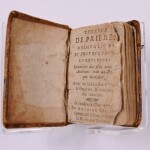 Huguenots honoured and cherished their Bible. As in England, it would be prominent in many Protestant homes, representing its status as the guardian and guide of faith. (Source: The Huguenots by Geoffrey Treasure, p.305). Other canny hiding places included dung heaps as well as picture frames with a false backing, designed to insert a Bible between mirror and back of the frame. Miniature ‘palm’ Bibles, an example of which is also held in the Museum’s collection (ref: FH2013.363), were tucked into sleeves or ladies’ updos, such as a chignon, bun or coif! I also discovered a similar story to that of the Fasquet family, it relates to the LeFevre Family Bible, a Geneva Bible, published in Switzerland, 1608. The Lefevre family lived near Strasbourg, northeastern France, in the Alsace-Lorraine region across the Rhine River from Bavaria, Germany. At the end of 1685, Abraham LeFevre’s wife, Sarah, wrapped their treasured Bible in vellum, to protect it from heat damage and hid it deep within the dough of a very large loaf. Sarah baked the dough, taking great care not to let it overcook, then left it out on the kitchen table to cool. It was decided that should their home be raided, the loaf would be grabbed and the family of eight would run to the nearby home of Daniel and Marie Ferree, wealthy Huguenot friends. The year 1685 is significant in the plight of the Huguenots. In October, Catholic King Louis XIV, ‘The Sun King’, (1638-1715) revoked the Edict of Nantes which had been created by Henry IV of France (1553-1610) on 13th April, 1598. King Henry’s law had granted a degree of religious freedom and tolerance towards the Huguenots. King Louis’s revocation placed families, like the LeFevres, in a very dangerous situation indeed. King Louis’s legislative changes now meant, either preaching or reading from a Protestant Bible, was banned. Huguenot churches and records were destroyed, their property confiscated. Emigration was forbidden. What happened to the LeFevre family? Sadly, their greatest fears were realised. Soldiers invaded the family home and slaughtered everyone, except for sixteen-year-old son, Isaac, who was elsewhere at the time. Upon returning and discovering the horrific scene, Isaac seized the loaf of bread and ran to the Ferree family, as had originally been planned. That same night, Isaac fled with the Ferree family to Bavaria, a Lutheran state. Isaac married Ferree’s daughter, Catherine, in 1704. They all stayed in Bavaria until 1708. Several years later, they came to England and finally settled in Pennsylvania. It is estimated that 50,000 Huguenots sought refuge in England between the early 1680s and early 18th Century. The Huguenots were the first newcomers to be described as refugees. The Huguenots represented England’s greatest influx of refugees. The largest Huguenot communities were initially to be found in Canterbury, Southampton, Norwich and East London (Spitalfields). This evening, Monday 30th April, at 7.30pm, BBC One (London region and BBC iPlayer after that), fashion historian and broadcaster Amber Butchart, presents a half-hour documentary, The First Refugees. The Huguenots were known for their technical, artistic and business skills. Amber explores the impact of Huguenot silk weavers, particularly in Spitalfields, on British arts and crafts. The documentary is part of the series, Civilisations Stories. 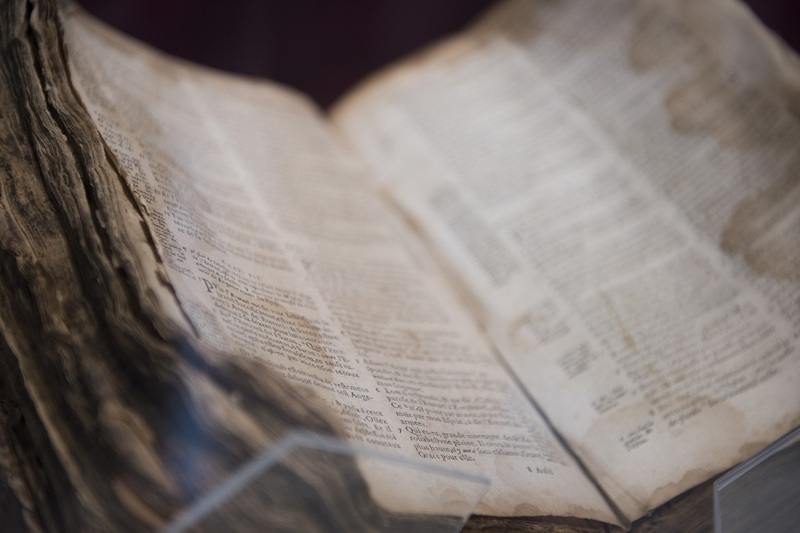 The Bible baked in a loaf of bread and the Huguenot Museum both feature in The First Refugees.